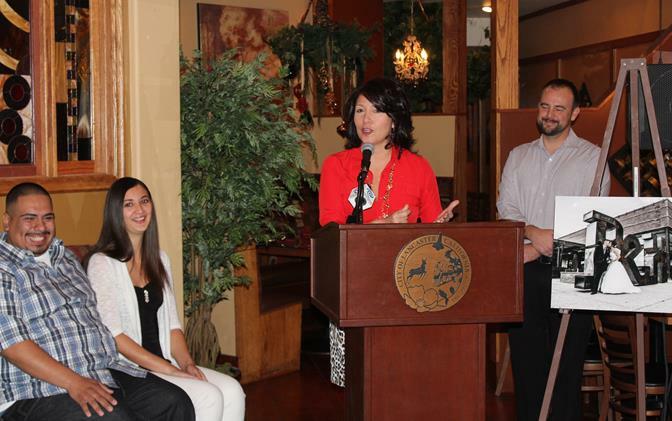 Lancaster Council Member Sandra Johnson congratulates the couple at a press conference Thursday to announce the winners. 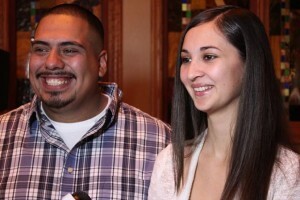 LANCASTER – Jazmin Petty and Oswaldo Gonzalez, both of Palmdale, won the second annual “Wedding on The BLVD” contest, The BLVD Association announced Thursday. The couple will receive a comprehensive wedding package for up to 50 guests on The BLVD in downtown Lancaster. Oswaldo Gonzalez and Jazmin Petty. Jazmin and Oswaldo first met when he was driving out of a business location. She was making an illegal U-turn and he accidentally cut her off. When the two stopped at the same red light a few moments later, Jazmin took the opportunity to give Oswaldo a piece of her mind. “I was furious,” Jazmin said. The two began talking and texting, and soon after, they ran into each other at a nightclub. They stayed up talking all night long and soon discovered that they were both born in the same area of Los Angeles and had even attended the same junior high school without knowing it. Jazmin and Oswaldo also take active part in community activities organized by their church. When it was time to pop the question, Oswaldo returned to where they had first met. In the center turn lane where he had first cut Jazmin off, he set up white roses, balloons, and a heart-shaped sign that said “Jazmin Petty, will you marry me?” With regular traffic flowing all around them, Oswaldo got down on one knee in the middle of the street and asked her to be his bride. The two will be married in a ceremony on The BLVD in June. The various aspects of the wedding package they have won are being donated by the merchants of The BLVD Association, with support from additional Lancaster businesses. For each item, the sponsoring merchant will work with the couple to select three options – for example, three wedding gowns, three reception menus, etc. Each week, the public will have the opportunity to view the three choices and vote for their favorite at www.theblvdwedding.com. These online votes will decide which item will ultimately be included in the couple’s wedding. Additional sponsors for this year’s Wedding on The BLVD include: Antelope Valley Bank, a Division of California Bank & Trust; Aven’s Furniture; Boulevard Flooring Emporium; Creativity Aint a Side Hustle; and In Perfect Balance pilates studio. To watch Jazmin and Oswaldo’s wedding planning progress and to vote each week on items for their wedding, visit www.theblvdwedding.com. 9 comments for "Jazmin and Oswaldo win a “Wedding on the BLVD”"
Wait. She was making the illegal U-turn but it was his fault for cutting her off? What a beautiful, giving young couple ! Will look forward to seeing the progress of their wedding plans . This couple touches my heart. I hope for them all the happiness they have shared with others. A wedding outside in June? In the AV, that is a death sentence for the wedding party as well as the guests. Its going to be very hot. They should have moved the wedding to either later in the year or in the early spring. Being in a wedding dress (or tux) outside in 100* weather for an extended amount of time will be miserable for everyone. I don’t remember it being that hot in June. Where do you live, Baker? I am sure the 100* statement was just being dramatic. However, with it being over 85* this past week and a record breaking hot winter, I would not be surprised if it were well over 100* in June. If it is 85* in February, I could only imagine how the summer will be. Hope all goes well for the wedding and the weather be beautiful.